What the mind believes, the body embraces. Appreciate the complex wisdom of the human body. I qualified as a certified specialised kinesiologist in 2012 and although I have a large drawer full of different Kinesiology module certificates, I have been a natural intuitive healer from a very young age. My qualifications include being a Dorn Spinal Alignment and Neural Organisational Technique Practitioner. Please note that sessions are by appointment only. I have a special interest in treating people suffering from Adrenal Fatigue and Heavy Metal Poisoning. I use the gentle art of muscle monitoring to access information about your level of health and wellbeing. I act as a facilitator to allow your body’s innate healing intelligence to restore balance and improved health to the neurological and physiological functions of your body. REMEMBER – the symptom is NOT the problem. Symptoms are merely the “messengers” from the body communicating that there are imbalances present. MY TREATMENT ROOM IS AT THE ORIGIN WELLNESS SPA, 5TH FLOOR OF THE DOUBLE TREE BY HILTON HOTEL. SAFE AND SECURE HOURLY PARKING AVAILABLE AT THE HOTEL. AT THE HOTEL RECEPTION ASK FOR ACCESS TO THE SPA ON THE 5TH FLOOR. Your physical body is the vehicle through which you experience your entire life. 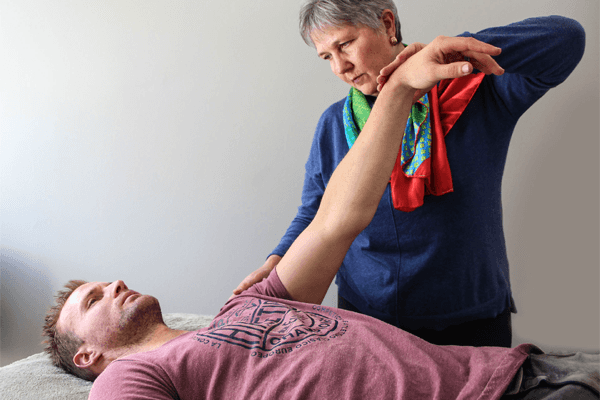 The philosophy behind kinesiology is that human beings (much like everything else in nature) are created as perfect, interconnected systems. We are designed to live in homeostasis – a perfect balance of mind, body, emotions and spirit – fully equipped for the things we want to achieve in life. However, sometimes we find ourselves in distress, whether it be physically, mentally or emotionally. This is our body’s way of indicating that we are not coping in one or more areas of our life. Stress activates a number of reactions in the body and when it becomes chronically intense, it can create diseases. Your body creates symptoms to act as a messengers to indicate that imbalances are present. We do not react to present stresses, but we react to past experiences. Kinesiology offers a very powerful means to rebalance ourselves – physically, mentally, emotionally and energetically –by decoding the symptoms and start by correcting the underlying cause or issues that have resulted in dis-ease, rather than simply treating or suppressing the symptoms. I am really pleased with the Kinesiology treatments I have been receiving from Lynn Angel. Her calm, informative and gentle approach immediately made me feel comfortable and at ease. Kinesiology has helped ease the acute back pain I had been experiencing for years due to scoliosis. It has also helped me to let go of a lot of tension and stress I had been carrying around with me. I am extremely grateful for the healing and would highly recommend Lynn Angel. Dear Anna, thank you for your kind review. I am delighted that a few kinesiology sessions have helped you so much.